Who says you can’t get your ebooks signed? I tried an experiment at World Fantasy Con last weekend…. All you need to get an ebook signed is a Sharpie. I will continue doing this until there is no room left on the back. By then, it will probably be time for an upgrade. I saw a few other people doing this as well, I believe I watched Elizabeth Bear sign one. Ah, one of the people I missed! I knew I should have arrived at the signing a bit earlier. That looks great! If you have a case for the Kindle, you’ll have more surface area for people to sign. 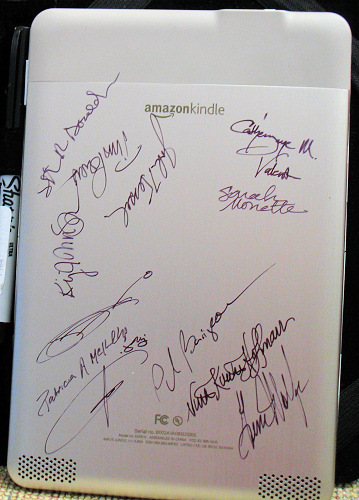 Did your Kindle have all of these authors’ books loaded on it at the moment they signed it? I have lots of short story collections on the Kindle, so when I didn’t have a novel by the author, I was covered by those. Heh. I got the actual ebook, not the device, signed – using the Note feature and the stylus on the Sony reader. Unfortunately I didn’t have many ebooks on it that weren’t owned by the library…. Nice! As a collector, I prefer the signatures to be in ink. Digital signatures are too easily copied and transferred. I can certainly see the advantage in sending ebook files off to be signed though. Really great idea. I saw folks getting print outs signed, but this seems somehow more appropriate. Reminds me of those signed baseballs.